by Chris Woodford. Last updated: July 8, 2018. Excuse me, sir, have you any idea how fast you were going? 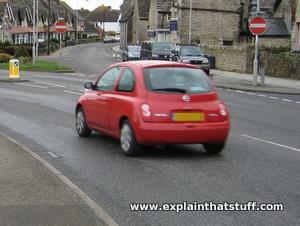 That's the question every motorist dreads being asked by a police officer at the side of the road. If you were staring straight ahead, not looking at the dashboard, you might have only a vague idea what to say. If you were looking at the speedometer, on the other hand, you'll know the answer exactly, possibly to within one or two kilometers or miles per hour. Have you ever stopped to think how a speedometer actually works? It's a really ingenious use of electromagnetism! Photo: Speedometers might look like moving-coil meters (voltmeters, ammeters, and so on), but they work in a totally different way. If you've read our article about motion, you'll know that speed is very simply defined: it's the distance you travel divided by the time you take. So if you go 200 kilometers and it takes you four hours to do it, your average speed is 50 kilometers per hour. Measuring your average speed after you've traveled is not actually that much help, especially if a police officer is asking you questions. How fast were you going sir? Erm, pull me over again in a couple of hours, when I get to my destination... and I'll divide the distance I've gone by the time it took... and then I should be able to give you some kind of an answer. Okay? What we're talking about here is average speed; what you need to know as a motorist is your instantaneous speed: the speed you're going at any given moment. Figuring that out is a lot harder than you think. If you've seen traffic cops (or speed cameras) by the side of the road, you'll probably be aware that they use radar beams to check speeds. 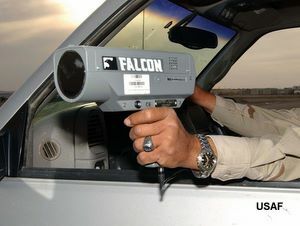 The radar gun (handheld or mounted inside the speed camera) shoots an invisible electromagnetic beam at your car at the speed of light. Your car reflects the beam back again, modifying it very slightly. The gun figures out how the beam has been affected and, from that, calculates your speed. Now in theory we could all have radar guns mounted in our cars, shooting beams out at lamp-posts and buildings and waiting for the reflections to come back—but that's an awful lot of bother! Isn't there a simpler way of finding out how quickly we're going? Photo: Measuring speed with a radar gun. Some speed guns use LIDAR (reflected laser light) instead of radar (which uses reflected radio waves). Photo by Lek Mateo courtesy of US Air Force. What we really need is a way of figuring out how fast the car's wheels are turning. If we know how big the wheels are, we can then figure out the speed fairly easily. But how do you measure a wheel's rate of rotation? Even that problem isn't simple. Imagine how much harder it must have seemed in the early days of motoring, back in 1902, when German engineer Otto Schulze invented the first practical solution: the eddy-current speedometer. Here's what we want out of our speedometer. We have the car's wheels rotating at a certain speed and we want to know, with a simple pointer and dial, what that speed is. So we need to connect the spinning wheels to the pointer in some clever fashion. Even that is pretty tricky: the wheels are racing around but the pointer, some distance away, merely flicks back and forth. How do we convert continuous, spinning motion into intermittent, flickery, pointer motion? The answer is to use electromagnetism! The shaft that turns the car's wheels is connected to the speedometer by a long, flexible cable made of twisted wires. The cable is a bit like a mini driveshaft: if one end of the cable rotates, so does the other—even though the cable is long and bendy. At the top end, the cable feeds into the back of the speedometer. When it rotates, it turns a magnet inside the speedometer case at the same speed. The magnet rotates inside a hollow metal cup, known as the speed cup, which is also free to rotate, though restrained by a fine coil of wire known as a hairspring. However, the magnet and the speed cup are not connected together: they're separated by air. The speed cup is attached to the pointer that moves up and down the speedometer dial. Artwork: Until about the 1960s, virtually all speedometers used a combination of mechanical power and electromagnetism. A small wheel (red), driven by a disc (orange) attached to one of the car's front wheels (gray), spun a cable (green) that snaked up to the speedometer (blue). This very early example, dating from 1904, used a "centrifugal" mechanism to move its needle; later designs switched to electromagnetism. Artwork from US Patent 765,841: Speedometer by Joseph W. Jones, July 26, 1904, courtesy of US Patent and Trademark Office (with colors added for clarity). How does it all work? As the speedometer cable rotates, it turns the magnet at the same speed. The spinning magnet creates a fluctuating magnetic field inside the speed cup and, by the laws of electromagnetism, that means electric currents flow inside the cup as well. In effect, the speed cup turns into a kind of electricity generator. But, unlike in a proper generator (the kind that makes electricity for your home in a power plant), the currents in the speed cup have nowhere to go: there's nothing to carry their power away. So the currents just swim about uselessly in swirling eddies—we call them eddy currents for that very reason. Since they're electric currents, and they're moving in an electrical conductor inside a magnetic field, another law of electromagnetism says they will create motion. How? The currents actually make the speed-cup rotate in such a way that it tries to catch up with the spinning magnet. But the hairspring stops the cup from rotating very far so it just turns a little bit instead, pulling the pointer up the dial as it does so. The faster the car goes, the faster the cable turns, the quicker the magnet spins, the bigger the eddy currents it generates, the greater the force on the speed cup, and the more it's able to pull the pointer up the dial. If you can't picture all that clearly, take a look at the little animation below. When the engine turns over, the driveshaft turns to make the wheels spin round. The speedometer cable, powered by the driveshaft, turns as well. The cable spins a magnet around at the same speed inside the speed cup. The magnet rotates continually in the same direction (in this case, counter-clockwise). The spinning magnet creates eddy currents in the speed cup. The eddy currents make the speed cup rotate counter-clockwise as well in an attempt to catch up with the magnet. Remember that the magnet and the speed cup are not joined together in any way—there's air in between them. The hair spring tightens, restraining the speed cup so it can turn only a little way. As the speed cup turns, it turns the pointer up the dial, indicating the car's speed. Apart from eddy currents and spinning cables, late-19th- and early-20th-century inventors tried a few other ways of measuring speed using ingenious mechanical methods. There were governor speedometers, for example, which worked a bit like centrifugal governors (speed limiters) in steam engines, with weights that lifted up higher as an axle span round faster. The weights were connected to a lever that pushed a needle up and down a dial to indicate speed. In 1916, a company called Waltham patented an air-cup mechanism similar to the eddy-current design but with a pair of air-filled cups facing one another. As one cup rotated, the spinning air inside it pulled on the air in a second nearby cup, connected to a pointer and hair spring, just like in an eddy-current speedometer. This idea was devised by none other than the great electrical pioneer and prolific inventor Nikola Tesla. 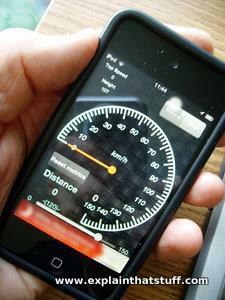 Photo: There are quite a few speedometer apps for smartphones, which calculate your speed using GPS (satellite positioning) signals (how far you've traveled) and the time. This one's Speedometer Complete by Daniel J. Pérez. Pretty much all speedometers produced until the 1980s worked using the eddy current and cable mechanism—much like Schulze's original, patented design. But there are drawbacks. First, there are lots of mechanical parts to wear out (which makes them inaccurate) or fail suddenly. If the speedometer cable breaks, the whole contraption instantly becomes useless—and it takes a mechanic to make a repair. Long speedometer cables are particularly impractical, which has always been something of a problem in large commercial vehicles such as trucks and buses. Eddy-current speedometers are also less than ideal for bicycles, not least because there isn't really room to mount a large speedometer on the handlebars! And it's not just the cable that poses a problem: it can be difficult to read a conventional speedometer dial if you're racing down the freeway, especially at night: do you really want to take your eyes off the road to figure out where the needle is on the dial? Some people prefer to see their speed as a simple number on a well-lit digital display. 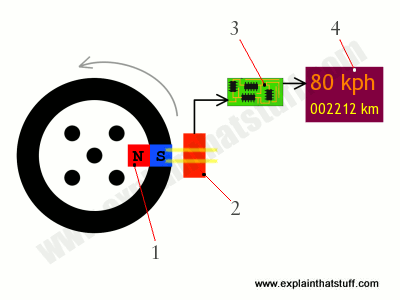 Artwork: How an electronic speedometer works: 1) A magnet connected to one of the wheels (or more likely to a driveshaft attached to one of the wheels) rotates at high speed. 2) Every time it makes one complete revolution, it passes a Hall-effect (or other magnetic) sensor and the field from the magnet triggers the sensor. 3) A circuit amplifies the signals from the sensor and translates them into your instantaneous speed and distance traveled. 4) A digital display on the dashboard acts as both a speedometer and odometer, displaying the speed and distance side by side. Electronic speedometers work in a completely different way. Small magnets attached to the car's rotating drive shaft sweep past tiny magnetic sensors (either reed switches or Hall-effect sensors) positioned nearby. Each time the magnets pass the sensors, they generate a brief pulse of electric current. An electronic circuit counts how quickly the pulses arrive and converts this into a speed, displayed electronically on an LCD display. Since the circuit is measuring the number of wheel rotations, it can also keep a count of how far you've traveled, doubling-up as an odometer (distance-measuring meter). Electronic speedometers can also display speeds with analog pointers and dials, just like traditional eddy-current speedos: in that case, the electronic circuit drives a highly controllable electric motor (called a stepper motor) that rotates the pointer through an appropriate angle. Electronic speedometers are more reliable and compact than mechanical ones and the motion sensors can be any distance from the display that shows you your speed, making them suitable for any kind of vehicle from a bicycle to a 40-ton truck! "Any idea how fast you were going sir?" "'Fraid not, officer—but I've got a pretty good idea how my car figures it out. Does that count?". How a speedometer works: Popular Science, August 1959. Here's an alternative explanation from the ever-excellent Popular Science magazine, with a better drawing of the speedometer mechanism than the one I've done. It also explains how moving-bar-type speedometers work. 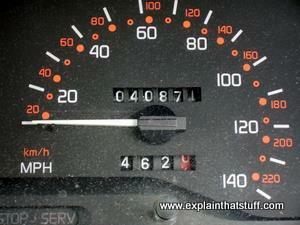 What you should know about your speedometer by Schuyler Van Duyne. Popular Science, September 1941. Another classic article with a great cutaway drawing of a speedometer. Also some historic photos of how speedometers used to be assembled in factories. Probably all done by robots now! US Patent 3,477,022: Electronic speedometer and odometer control circuit by Paul D. Le Masters et al, General Motors Corporation. Issued November 4, 1969. Describes a modern, Hall-effect type speedometer and odometer. US Patent 1,209,359: Speed indicator by Nikola Tesla, Waltham Watch, Co., May 29, 1914. An eddy-current or air-drag speedometer patented by one of the pioneers of electromagnetism. US Patent 1,038,016: Magnetic speedometer by John K. Stewart, September 10, 1912. A typical eddy-current speedometer. 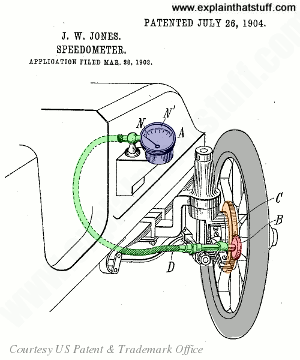 US Patent 765,841: Speedometer by Joseph W. Jones, July 26, 1904. A simple mechanical speedometer from the early 20th century. US Patent 765,841: Electric odometer and speed indicator by W.A. Phillips. April 19, 1892. An odometer and speedometer based on a centrifugal governor. Is an odometer a help or hindrance to your bike ride? by Nicola Brady. The Guardian, September 30, 2011. Speedometers can be disappointing and demotivating for serious cyclists. GM Makes Your Entire Windshield a Head-Up Display by Tony Borroz. Wired, March 17, 2010. How long will it be before speedometers are routinely projected onto our windshields? Speedometers In the Subway: A Bumpy Life by Richard Perez-Pena. The New York Times, August 21, 1995. How New York subways have switched from mechanical to radar speedometers for greater safety. An interesting piece from the Times archive.